Here are things I have learnt about Xfce. Xfce is a traditional desktop that to first appearance is rather basic however hidden just below the surface is great power. With a little effort it can be customised to be a useful and good looking desktop environment. My first suggestion is to try the Korora Xfce remix. Like all Korora releases it is based on Fedora but comes with all the applications and add-ons you need to do just about anything. It also has some different configuration options compared to Fedora that provide a more useful and better looking desktop. The Korora Project is currently dormant but this will be updated soon with an alternative. These tips were all tested in my Korora 28 Xfce system with Xfce 4.12 but most were used on previous versions too. Some of these tips may not apply to other versions or distros although the vast majority will. Package names and paths may change in other distros or even other Fedora versions, look for something similar. There is a development version, Xfce 4.13, which will be become 4.14 when the next stable release is made. As the main object of this new release is the conversion to GTK3 many of the tips listed here will no longer work or will need to be set up differently. Hence there is no guarantee what you read here will apply if you run 4.13 unless it specifically mentions 4.13. Fedora 29 comes with Xfce ver. 4.13. Many places in Xfce have an option for Help. The help is provided online so you need a working internet connection to view the help screens. However many applications include a Man page which can be accessed in a terminal e,g, ‘man xfce4-terminal’ shows detailed information on using the Xfce terminal. To store passwords etc. Xfce uses gnome-keyring. When you create a password in any application such as network -manager you will be asked for a password to save it. That password is the password to open gnome-keyring. When you use the application again you will be asked to enter the password so your saved data can be accessed by the application. It is possible to avoid having to enter the password when the keyring is opened. If you use your user password, i.e. the same password you use when logging in, the keyring can be opened automatically. As root or using sudo open /etc/pam.d/lightdm in your editor, look for the line ‘-auth optional pam_gnome_keyring.so’ and remove the leading ‘-‘. Save the file and next time you log in you won’t need to provide the keyring password. Unfortunately this doesn’t work for Chrome which uses its own keyring within gnome-keyring so needs the password to be entered again. The desktop icons can be configured by right clicking on the Desktop and selecting Desktop Settings – Icons. Here you can select the category of Icons that will be displayed. You can also select to use a single click to activate Icons. If you don’t want desktop icons you can set that here as well. However if you select “None” you will also lose the Desktop right click context menus. It is better to set the option to “File / Launcher Icons” and un-select all the default icons. Fortunately Korora comes with the icons already configured to hide the title backgrounds which gives a better appearance than the default. The Xfce terminal, xfce4-terminal, has some hidden features. One of its most powerful one is the dropdown option which I covered elsewhere. The dropdown preference screen includes an option to add an icon to the notification area. Clicking on this icon will open the terminal. A right click gives access to preferences and close Window. The preference window can also be accessed with a right click anywhere in the terminal area where there is also an option to add a tab or another window. Middle click will paste. The Dropdown preference screen also has an option for Opacity this applies to the whole terminal including the text. The transparency option on the Appearance tab only affects the background. The Duration option controls the speed of the dropdown animation. In version 0.4.0 Mousepad has introduced an option to remove the Menubar. Click on the View menu and deselect Menubar. To get the menubar back right click in Mousepad and there is an additional option, which only appears when the menubar is disabled, to show the Menubar again. If you find it difficult to locate the cursor on your desktop there is a built in option in Xfce to help. It is called Xfce4-find-cursor. It can be run from a terminal or the Alt-F2 command box. However the easiest thing is to set up a Keyboard shortcut for it. 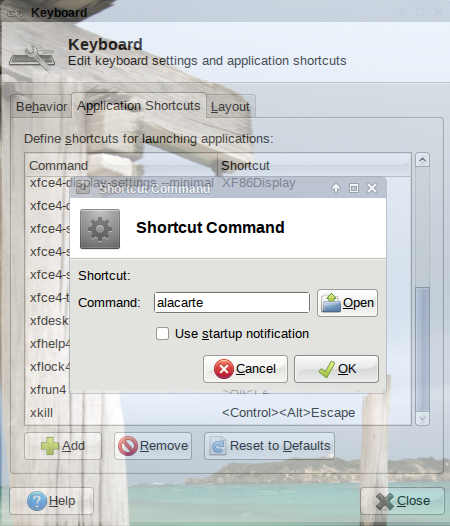 to do that go to Settings – Keyboard – Application Shortcuts and add a new shortcut with the command as xfce4-find-cursor. Select a shortcut you will remember and test it. You will see expanding red circles with this command. It is simple to add new cursors to your system. Of course the easiest way is to use those already packaged by your distro. However if you want to add others simply place the cursor theme in the ~/.icons directory. You can then go to Settings – Mouse and Touchpad – Theme and select the new cursor theme. Thunar is a simple but powerful file manager that meets most people’s needs. It offers tabs (ctrl + t) as well as all the regular actions. You can add items to the left pane if it is set to Shortcuts, set it in View – Side Pane. Simply drag and drop items from the main pane. You can also use right click – Send to – Side Pane. When ‘View as’ is set to Detailed you can alter the column layout in the View Menu – Configure Columns. You can hide the Menubar by pressing ctrl + m, press it again to unhide it. Xfce’s panels can be configured in a number of ways. The appearance, location, size and operation can all be easily altered. There are endless possibilities to what you can do to customise your panel. Actually Xfce’s panels are more configurable than most docks plus you can add as many panels as you wish. Searching for guides will bring up many different ideas. To edit your panel settings right click anywhere on the panel and select panel then Panel Preferences. If you have more than 1 panel first check the correct panel is selected. It will have a dotted (aka. marching ants) border. To move the panel first unlock the panel which will add handles to the end of the panel. Click on these and drag the panel where you want it. If appropriate change the Mode setting to Horizontal or Vertical. The Deskbar option is a vertical panel with horizontal plugin displays. The ‘Don’t Reserve Space on Borders’ option allows windows to cover the panel. There are 3 options for hiding the panel, Never, Intelligent and Always. Never is self explanatory. Intelligent will only hide the panel if a window touches or covers the panel. Otherwise it will always be visible. Always will only show the panel when the cursor is hovering near the location of the panel. The Appearance tab has option to set the background, adjust the alpha setting to set the panel transparency, zero is fully transparent while 100 is fully opaque (4.12 only see next paragraph for 4.13). The opacity settings adjust the setting for panel contents with 2 settings, ‘enter’ is for when the panel is selected and ‘leave’ for when it isn’t. In Xfce 4.13 the alpha setting has disappeared from the Appearance tab. For some inexplicable reason it has been hidden. To modify the alpha setting go to the Appearance tab and select Solid Colour under Background – Style, click on the colour that appears and in the colour selection screen click to add a custom colour. A dialogue to set the colour appears with an un-labelled slider in the lower part of the box. This is the hidden alpha setting. Set the desired level of transparency here and if not set to zero you will need select the colour too. The Items tab allows you to add or remove the panel contents. To add a item click the Add icon, select the plugin you want to add or launcher to add a shortcut to any application. Once you have added an item you can adjust its location with the arrows. To set the application settings select Launcher in the item list and click on the Edit icon. There click on the edit icon and enter the application details. On the advanced tab you can select to disable tooltips for that launcher and to show a label in place of the icon. For something different right click on the panel and select Panel->About. Click the Credits button. Click on the last entry under Inactive Maintainers and select the link of Tic-Tac-Toe. Once a launcher is added to the panel, you can edit its settings by right clicking on the item and selecting properties. Right Clicking on a panel plugin and selecting properties will show the plugin’s settings. A separator is a special plugin that will add gaps between other items. It can be set to transparent, so it is invisible, and expand which will move every item to right of (or below) the separator to the right (or lower) end of the panel. If you have the Workspace Switcher on the panel it can show icons for the running applications. This lets you see at a glance on which Workspace a particular application is. To activate this right click the switcher and select Properties. In the properties select ‘show miniature view’. If the miniature is just a blank square you need to increase the size of the panel. The DateTime plugin is a popular addition to the panel to replace the clock. Right click to adjust its properties. Hovering over the plugin with show the current date and clicking on it will display the calendar for the current month. A new utility, Xfce Panel Switch, soon to be renamed Panel Profiles, was added to Korora for 24. It has the facility to back up and switch various panel configurations. See my previous post for more details. In Xfce 4.13 there is a Backup and Restore button in Panel Preferences which open the Panel Switch utility. By default, just like Fedora, the earlier versions of Korora Xfce didn’t have ‘tap to click’ enabled. This is a popular option for laptop users and easy to set up. In the menu select Settings – Mouse & Touchpad. If necessary select the Touchpad from the dropdown list of devices. the Touchpad tab won’t appear if the Touchpad hasn’t been selected from that list. 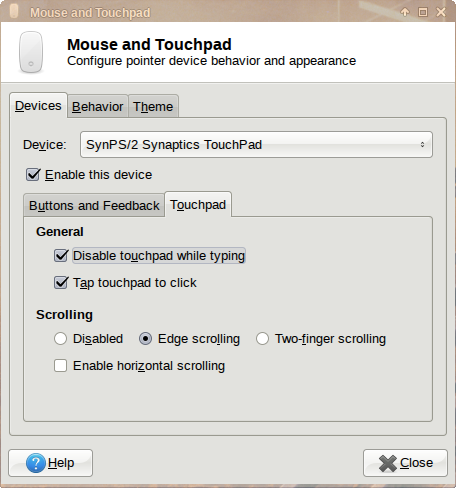 Select the Touchpad tab and select the options “Disable Touchpad while Typing” and “Tap to Click”. Disabling the touchpad while typing adds a short delay before the touchpad works again which can be an annoyance but it is much better than finding you have been jumping all over a document you are typing. In later versions the Duration of that delay can be adjusted. The desktop wallpaper, or background as Xfce calls it, can be set to a colour, an image or a slideshow. Right click on the desktop, select desktop settings – background. On the right is Style, select the format the image will be displayed in. Select none if you want a colour. Colour is a good choice for a system with low resources particularly ram. Under colour you have the choice of vertical or horizontal gradients and a transparent background. On the left you can select a folder which holds the desired background. If you want a slideshow all the images in this folder will be used. After you select the folder the images it contains are displayed. Select the desired image. Even if you wish to have a slideshow first select an image to start the slideshow. If you don’t select an image the folder selection will not be saved. There is an option to apply these settings to all desktops. If that is not selected you can go to each virtual desktop and select a different background image. If you wish to have a slideshow select the “Change the Background” option and set the frequency of the change. This can be in seconds, minutes or hours or just at each login. I set the interval to 5 minutes, a longer time seems too long but much more frequent is a distraction. The last option is to display the backgrounds in a random order which I also prefer. Tooltips can be useful but many people don’t like them or find them a distraction. Tooltips can be disabled for individual launchers or system wide. Right click on a launcher, select advanced and there is an option to disable tooltips. To disable all tooltips you need to add a line to the gtk2 configuration file. Open the .gtkrc-2.0 file in your preferred editor (if it doesn’t already exist create it) e.g. You can set the preferred application to open a particular file type using Settings – Mime Type Editor however if you want quickly reassign a single file type there is a much quicker way. Open Thunar and locate a file of the type you want to assign, right click and select “Use as default for this kind of file” and select the desired application. If your media player adds an icon to the notification area on the panel or you are using the Pulseaudio panel plugin you can place the cursor over the icon and adjust the volume with the scroll wheel. Note: this doesn’t work with all players, if your player doesn’t support it use the Xfce Pulseaudio plugin. The older Xfce Mixer has been deprecated and replaced by the Xfce Pulseaudio plugin in Korora 23 and later versions. Sometimes, particularly when you are asking for support, it is important to know what version of Xfce you are running. On the menu under Documentation is ‘About Xfce’. You can see the same information in a terminal with ‘xfce4-about’, ‘xfce4-about -V’ gives the version and ‘xfce4-about –help’ shows other options. Korora includes the Screenfetch utility. Running ‘screenfetch -n’ will display much important information about your system without the ascii logo that Screenfetch normally shows. Go to Settings – Keyboard and select the Applications Shortcuts tab. Click the add button, if you are adding a shortcut for an application you can click on Open and it shows you the /usr/bin directory, if you know the application command you just type it. Select the appropriate application e.g. to add a shortcut for Alacarte select alacarte from the list or just type alacarte, select startup notification to see the twirling wheel while the application loads. Click OK and another window appears, press the desired key(s) and the window will close. Test your shortcut. To edit an existing shortcut double click on it and it will open the edit window. You can delete a shortcut by selecting it and clicking on remove. The Window Manager has its own shortcuts and they can be viewed and edited at Settings – Window Manager – Keyboard. It is not possible to use the Super (aka Win) as both a shortcut and as a key modifier. But there is a work around. See Using the Super Key in Xfce. This has been added as standard to Korora 24 and later versions. Pressing the Super Key will open the Whisker menu on these versions. Xfce 4.12 added an option to have a preview of the Window instead of an icon when using ALT-Tab to cycle windows. The option uses the compositor so will only work when Compositing is on. This option can be turned off in Settings – Window Manager Tweaks – Compositing. There are options for Cycling in Settings – Window Manager Tweaks – Cycling. As an alternate to Alt-Tab middle click on the desktop. This brings up a list of workspaces and includes the open windows. Click on a window in the list to go to that window. There are options for the Window List Menu in Settings – Desktop – Menus. If the list doesn’t appear when you middle click confirm that it is enabled there. Everyone would be familiar with the maximise button on a window’s title bar. It enlarges a window to fill the screen. Xfce can also maximise a window in the horizontal or vertical direction only. A right click on the Maximise icon enlarges the window horizontally and a middle click will enlarge it vertically. Repeat the click to restore the window to its former size. This may not work on applications that don’t conform to desktop standards such as Chrome browser. Also a double click while holding the Alt key will return a maximised window to its former size. Workspaces, aka virtual desktops, are a powerful and underused feature of Linux. Xfce has a number of options to configure Workspaces. Go to Settings – Workspaces to set the number of workspaces available. You can rename each Workspace by double clicking on each line on the list. The Margins tab will set an area on each screen edge where windows won’t appear even when maximised. These are usually set to zero. If you add the Workspace switcher to the panel you can set the number of rows. This is important if you select to wrap workspaces in Settings – Window Manager – Advanced. There are additional options in Settings – Window Manager Tweaks – Workspaces including the option to use the scroll wheel to change workspaces. Under Settings – Window Manager Tweaks – Focus is the options for when a window raises itself. E.g. if you click on Help in a Xfce application it will open it in your browser. If the browser is already open on another workspace you can select to go to that workspace or bring the browser to the current workspace or do nothing. The keyboard shortcuts for managing and accessing each Workspace are set in Settings – Window Manager – Keyboard. A middle click on the Desktop shows the Workspaces in use and the applications open on them. You can select the Workspace to go to from there too. Korora Xfce includes the Alacarte menu editor. To use alacarte right click on the menu icon on the panel, select Properties which opens the Menu preferences and there is a button the Edit Menu. On that screen there are a number of options for the menu, the first option is ‘Show generic names’. If you have more than one application of the same type installed, e.g. 2 browsers, unselect this so you will see the name of the application not just a generic title. As well as the standard menu on the panel you can find and start applications using the Application Finder (on the menu or ‘alt + F3’). You can also right click on the desktop and select Applications. The right click Applications menu can be hidden by selecting ‘None’ for Desktop Icons under Desktop Settings. Many people prefer the Whisker Menu so it is the default in Korora. It has the best features of the menu and the Application Finder in one application. Add it to a panel as described in the Panel section above. There are preferences that can be set for WhiskerMenu. To access the preferences right click on WhiskerMenu on the panel and select Properties. You can add a user icon to the Whisker menu by creating an image file called ‘.face’ in your home directory. While holding a mouse click and the alt key you can move any window simply by dragging. Similarly while holding a right mouse click and the alt key you can resize any window simply by dragging. Using the scroll wheel on your mouse while holding down the alt key will zoom the desktop. A double click while holding the Alt key will return a maximised window to its former size. You can select another key in place of the Alt key in Settings – Window Manager Tweaks – Accessibility. Many people like to take shots of their screen, sometimes to record their current configuration, maybe to share on social media or if creating guides like this one. Screenshots can also be useful to explain issues you may be having. Whatever the reason Xfce has a very useful screenshooter called Xfce4-screenshooter. It can take shots of the whole screen, the active window or a user selected region of the screen. In Korora there are keyboard shortcuts set for the whole screen and the active window, they are PrtSc and Alt + PrtSc respectively. I also add a shortcut for a region, (I use Ctrl + PrtSc). If used from the command line use option -f for full screen, -w for active window and -r for a region. When using the region option the screen will darken and a crosshair will appear. Use this to select the area and then a window will appear with options. There is also a delay option which gives time to select the active window or display some other part of the desktop such as a tooltip, menu or panel plugin. In 4.12 there is also the option to upload your screen shot to ZimageZ or Imgur. See ‘man xfce4-screenshooter’ for all the options. Recent versions of Korora include the Screenfetch utility which can be run in a terminal to display the system details. This makes an interesting and informative addition to your screenshots. Once you have set up your Xfce desktop the way you want you should back your settings so you don’t have to do it all again. From your home directory /home/username you need to backup the .config directory and the .gtkrc-2.0 file. Actually the .config directory holds more than the Xfce settings it also has settings for many applications. There is a good thread on the Fedora Forum on customising Xfce, it is a bit old but still accurate. As well as the Korora support options you can get help on Xfce on the Xfce forums and the Fedora Xfce mailing list. There is also the #xfce channel on freenode. The Korora option provides general support however the other options are Xfce specific. This page was last updated on 18th January 2019.